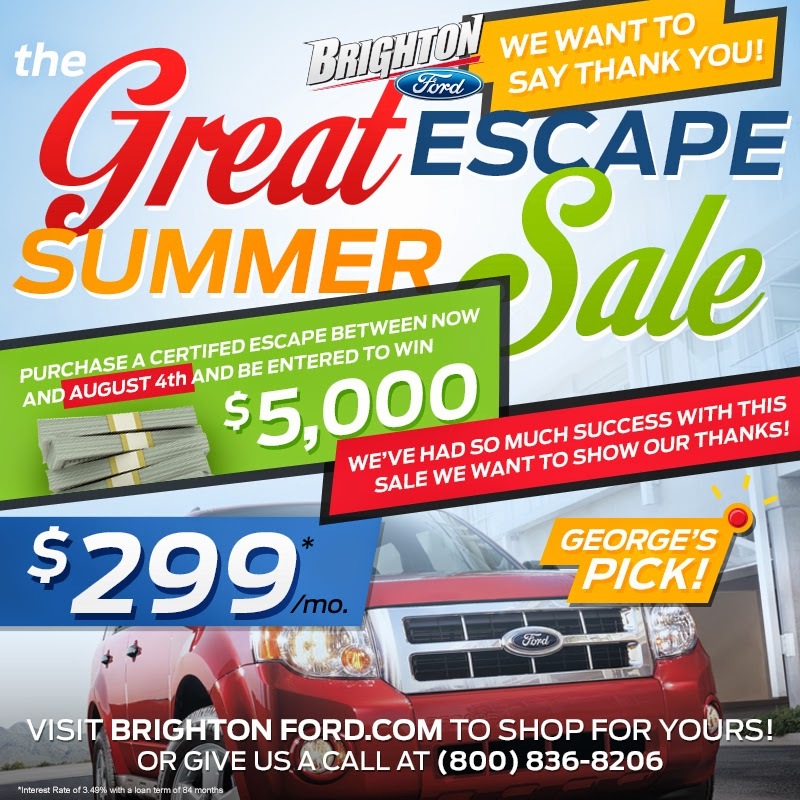 Brighton Ford : Win $5,000 from the Brighton Ford Great Escape Summer Sale! Win $5,000 from the Brighton Ford Great Escape Summer Sale! BRIGHTON, Mich - Our Great Escape Summer Sale has been so successful, we want to want to show our thanks by giving a customer more than just a great vehicle. Anyone who purchases a certified 2012 Ford Escape between now and August 4th, will be entered to win $5,000 from the Brighton Ford Great Escape Summer Sale! That's right, you not only have the opportunity to take home a beautiful, full loaded, 2012 Escape at a low price, but will also be given the opportunity to be entered in a drawing for $5,000! You are already imagining what you could do with that extra cash, aren't you? So, what are you waiting for? Stop by Brighton Ford to purchase a hand picked, certified, low mileage 2012 Ford Escape at an unbeatable price of $299 per month*. Don't forget, if you purchase the vehicle before August 4th, you will have the chance to win $5,000! Questions? Looking for some more information? Feel free to visit us at Brighton Ford or give us a call at (800) 836-8206! At Brighton Ford, we want to provide our customers with the best service and experience, while receiving a great deal on their chosen vehicle. Brighton Ford is located at 8240 Grand River Ave. just north of I-96 in Brighton. We are a family owned and operated business that strives for customer satisfaction. For more information on Brighton Ford visit BrightonFord.com or give us a call at (800) 836-8206.